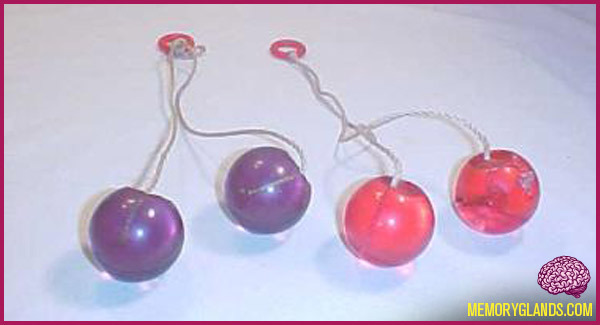 Clackers are toys which were popular in the late 1960s and early 1970s. They consisted of two 2 cm, hard balls suspended on string which were swung up and down so they banged against each other, making a clacking sound. Clackers are similar in appearance to the Argentinian weapons, bolas. They are formed out of two hard plastic balls, each about two cm in diameter, attached to a tab with a sturdy string. The player holds the tab, with the balls hanging below. Through a gentle up-and-down hand motion, the two balls swing apart and back together, making the clacking noise that give the toy its name. With practice, it is possible to make the balls swing so that they knock together above the hand as well as below.